A few weeks ago I started cleaning in my home office. It had gotten so bad there was really only a path to my desk and barely enough room for the keyboard on top of the desk. I ran out of time to complete the task, but made tremendous progress. Oddly enough, when I was doing it I thought, "Hmmmm... well, this will stir up something." I guess it did. This afternoon and evening I've been working on some other things in here and I've come to some conclusions. 1. I need to gather up all my change, cash it in, and come up with a new system. My old system is just tossing coins here and there. Eventually there are piles that spill off the edge of the desk and it's a mess. I now have a container for them. We'll see how this goes. 2. 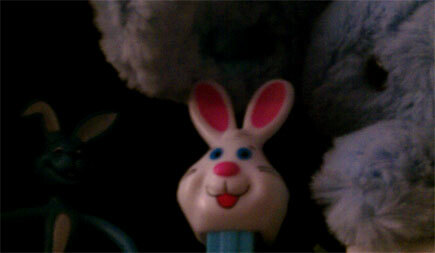 Apparently I collect blue bunnies. I didn't know this about myself, but I have four in here. I bought one of them 3-4 years ago at Easter. The others have come to me by way of Easter gifts. I just noticed today they're all blue - even the Pez dispenser. 3. I am a pen addict. I already knew this about myself, but it's worse than even I realized. I already had two containers full of pens on my desk, and another three on the shelves near my desk. I had four containers on the desk at the Cosmosphere and when I sorted through them to bring my pens home and leave theirs I still had mostly full holders. I like pretty colors of ink, what can I say? 4. I have a lot of stationery. I also knew this about myself. It kind of goes well with the pens, when you think about it. But, I mean, I have a LOT of stationery. A lot. 5. I have enough postage to send almost all of that stationery out into the world. I have everything from one cent stamps on up. I get some odd satisfaction out of mixing and matching to get to the correct amount. No, I don't know why. I just do. No doubt the personal archeaology dig will continue in coming days. Love the personal archeology. Need to do some myself on my desk. Spent four hours unearthing a notebook that I had used a month ago and not touched since. I don't want to even think about what else I might find in these old tombs.